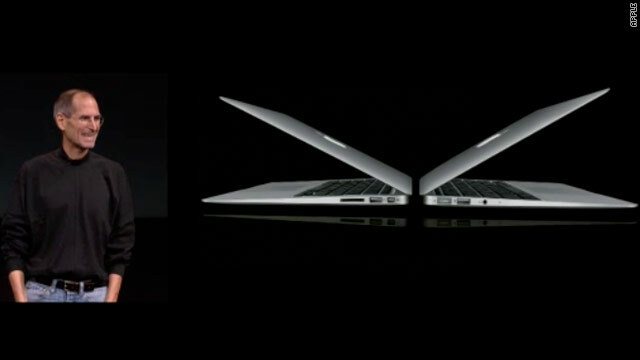 Apple CEO Steve Jobs unveils sleeker, lightweight MacBook Air laptops at an event Wednesday. (CNN) -- While Apple's Wednesday event was called "Back to the Mac," much of the undertones harkened back to its popular touch-screen products. The MacBook Air laptops will be available to buy Wednesday in 11- and 13-inch-display models. The smaller size costs $999, and the larger costs $1,299. Neither model includes a hard drive or DVD player. The machines are lighter, at 2.3 to 2.9 pounds, and thinner -- the wedge-shaped aluminum gizmos measure just over two-thirds of an inch at the widest edge. "We really see these as the next generation of MacBooks," Steve Jobs, the company's chief executive, said at the event. "We think all notebooks will be like these someday." Rather than using DVDs, software will be installed through a new App Store, similar to the digital marketplace on Apple's iPhone and iPad. This digital store can be downloaded to Macs running the newest version of OS X Snow Leopard sometime in the next 90 days, Jobs said. For an event centered around Apple's flagship Mac computers, the focus Wednesday often turned to its mobile-focused iOS software. "We've invented some new things, and we've perfected them over the last several years," Jobs said of iOS. "We're inspired by some of those innovations. We'd like to bring them back to the Mac." Apple also demonstrated it hasn't run out of jungle-cat names with its new Lion operating system. The software borrows many concepts from iOS, including a similar presentation of software, full-screen use, a focus on touch navigation and, of course, the App Store. Apps aside, Apple said it would release a Mac version of FaceTime, the video chat program for iPhone and iPod Touch, on its website Wednesday. A new version of the iLife software, which includes apps such as iPhoto, GarageBand and iMovie, was also released Wednesday, costing $49. It's included with new Apple computers. These apps can aid struggling musicians or let users craft boilerplate movie trailers. The new MacBook Air, too, borrows things from Apple's hand-held products. "What would happen if a MacBook and an iPad hooked up?" Jobs joked. "This is the result." But don't expect to be able to tap buttons on the laptop's screen. "Touch surfaces don't want to be vertical," Jobs said onstage. "After a short period of time, you start to fatigue. And after an extended period of time, your arm wants to fall off. It doesn't work. It's ergonomically terrible." Due to the size of these new computers, some observers may be quick to draw comparisons to netbooks. But those devices are usually cheaper and pack a slower type of processor. "Netbooks are getting squeezed on all sides," including pressure from tablets, said Gartner analyst Van Baker. The netbook market "grew very fast, and now they're shrinking very fast," he added. "The question now is: Are full-blown notebooks going to replace netbooks?" Baker said. Apple is spring-boarding from a record quarter for its computer division, having sold 3.89 million Macs between late June and late September. While the company sold more iPhones, iPods and iPads than Macs, profit margins on desktops and laptops are generally higher, so they make up a crucial part of Apple's revenue. Computers made up a third of Apple's revenue last year, Tim Cook, chief operating officer, said during the news conference. "If it was a standalone company -- and we have no plans to do that," Cook joked, "it would be 110 in the Fortune 500 list." CNN's Brandon Griggs and Doug Gross contributed to this report.